Thank you, Diana Natalicio, President of University of Texas El Paso, and everyone at here who made my visit and this lecture possible. And thank you very much to Roberto Coronado and the Federal Reserve Bank of Dallas, El Paso Branch. And thank you all for making the effort to attend this evening. Special thanks to my much-admired creative writing colleague and old friend, Lex Williford. My husband, who is Mexican, likes to joke that I missed being born Mexican by five miles. You might guess that means that I was born right here in El Pasothis "City of Surprises," as writer and editor Marcia Hatfield Daudistel calls it. My dad was an artillery officer stationed at Fort Blissand I understand that he took some engineering classes here at UT El Paso. So it is a very special honor for me, as a native El Pasoan, to have been invited to speak to you today. I can't say it's like coming home, because my parents are from Chicago and New York, and when I was still a baby, my dad decided on a career in business, and he took the family out to Californiato the part of the San Francisco Bay Area now known as Silicon Valley. Culturally speaking, I'm a Californian. But back to El Pasoto quote Marcia Hatfield Daudistel again this "dark-eyed stranger abducted into Texas by the treaty of Guadalupe Hidalgo in 1848." For me, to be here in El Paso is like coming home in another, deeply meaningful sense. This is a border city. I am a border person. Where others might be... let's say, a little nervous... we border people go back and forth between the U.S. and Mexico with ease, we are oftentimes bilingual, bicultural or at least we don't blink at some of the more exotic juxtapositions, whether culinary or musical, and the mixed up lingo. I too, have been known to speak my gringa-chilanga version Spanglishor, I might throw clumps of español para que me entiendes bien into my English. I don't live on the border geographically, but culturally. I mean to say, when I got married 29 years ago, my husband and I moved to Mexico Cityhis home town, Chilangolandiaand now I have lived in Mexico City for more years than I have lived anywhere else, including California. And I should mention, I don't live in Mexico as a typical expat, coccooned among my fellow Americans and Canadian snowbirds. I am enconsed in a Mexican family, living in a Mexican neighborhood, and I have many very dear Mexican friends and colleagues. Long story short, over the last three decades of my life, although I remain a U.S. citizen, Mexico has become my world. This is why my books are all about Mexico. I hope my books might be both beautiful and usefulI write them with as much courtesy for the reader as I can muster. But the truth is, the reason I write them is because I want to delve in and explore the complexity around me, and then, having gained a new level of understanding, tell the story my way. Living in Mexico, very quickly, I learned to distrust the easy assumptions and much of the narrative about Mexico spooned out for us, whether on this side of the border or the other, whether in tourist guides, newspapers, television, paperback novels, movies. And sometimes... even in textbooks. In Mexico, it is often said that nothing is as it seems. If you halt the show and question sincerely and energetically question read the bibliography, and read beyond the bibliography; take the time to interview people, really listen, with both an open mind and an open-heart; go to places and stand there and look around for yourself; roll up your sleeves and dig into the archives... it has consistently been my experience that you will uncover secrets and surprises. Of course, that could be said about the whole world, from Azerbaijan to Zambia. And El Paso, Texas, itself. But Mexico is what my books are about. I won't stretch your patience to go on about all the books. I'm going to give you but three examples. 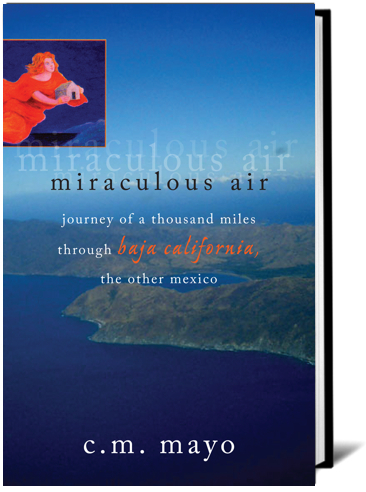 The first is from my travel memoir, MIRACULOUS AIR: JOURNEY OF A THOUSAND MILES THROUGH BAJA CALIFORNIA, THE OTHER MEXICO. The title comes from a quote from John Steinbeck's The Log from the Sea of Cortez. "The very air here is miraculous and the outlines of reality change with the moment." What I had been told as a child in the California public school system, that the California missions, founded by the Spanish padres, began in San Diego, was not only not trueit obscured one of the greatest, strangest, and most tragic stories of the Americas, that of the indigenous peoples' encounter with the Jesuit missionaries, whose first permanent California mission was hundreds of miles south of San Diego, on the Sea of Cortez at Loreto. Loreto: Yes, that is an Italian name. The Jesuits named it after after an important basilica in Italy which enshrines a brick house as the Church asserts, this is house of the Virgin Mary, brought from Nazareth during the Crusades by angels who flew it over the Adriatic Sea. Loreto was founded in the late 17th century roughly the same time that in the province of Texas, we see the first Spanish settlement at San Francisco de los Tejas. When the Jesuits arrived in California, as they called this nearly 1,000 mile-long peninsula, they believed it was an island. Today we call it Baja or Lower California and unlike Upper California, lost to the United States after the US-Mexican War, it remains part of Mexico. The Jesuit missionary who founded Loreto was Giovanni Salvaterra, an Italian from Milan, who, on arriving in New Spain, hispanicized his name to Juan María Salvatierra. One of his right-hand men, and a founder of other missions in California, was Father Francesco Piccolo, a Sicilian. Among the Jesuit padres in California, or as we say today, Baja California, there were a Frenchman, a Czech, a Scotsman, a Bavarian, a Bohemian. Many Germans. In 1767, for reasons known only to himself, the Spanish king decided to expell the Jesuits from his realm. The newly appointed governor of California, Don Gaspar de Portoláwho would, eventually, head north with the Franciscans who would found the so-called California missions that I learned about in school arrived in Loreto later that year. From all over the peninsula the missionaries began to arrive at Loreto: from the South, Ignác Tirsch and Johann Bischoff; from Dolores, Lambert Hostell; from San Luis Gonzaga, Johann Jakob Baegert; José Juan Díez from La Purísima, Franz Inama von Sternegg from San José de Comondú, Miguel del Barco from San Javier. Francisco Escalante came from Santa Rosalía de Mulegé, José Rothea from San Ignacio, and Victoriano Arnés from Santa María Cabujakaamung, leaving still-green his first crops of wheat and cotton. At Mission Santa Gertrudis, Georg Retz had broken his leg and could neither walk nor ride; his neophytes carried him on a litter the nearly two hundred miles through the canyons of the Sierra de San Francisco, the Vizcaíno Desert, and the Sierra de Guadalupe. Wenceslaus Linck arrived last, because he was delayed tending to the dying in an epidemic at his Mission San Francisco de Borja. When the missionaries reached Loreto, Governor Portolá embraced each of them and, as was the Spanish custom, he kissed their hands. Portolá had read the Order of Expulsion and taken possession of the Jesuits' treasury and storehouse: a meager supply of gold and silver coins, a few bolts of cloth, tools for the soldiers and other gente de razón, and some dried meat and grain. No one was arrested. The Jesuits were to sail on February 3, 1768. Their ship, the poor two-masted Concepción, waited at anchor in the harbor. They would cross the Sea of Cortés, then travel overland to Veracruz; from there, they would be sent to exile with their fellow Jesuits in the Papal States and Germany. "behold we were surrounded on all sides by the people, the Spanish soldiers among them. Some knelt on the sand to kiss our hands and feet, others knelt with arms outstretched in the form of a cross and publicly pleading for pardon. Others tenderly embraced the missionaries, bidding them farewell and wishing them a happy voyage through loud weeping and sobbing." The Indians carried the priests on their shoulders through the surf to the launch. There the priests recited the Litanies of the Virgin of Loreto, their voices carrying over the darkness of the water. "We were sixteen Jesuits in all," wrote Father Baegert. "Exactly the same number, that is, sixteen Jesuits, one brother and fifteen priests, we left behind, buried in California." The Jesuits had been on the peninsula for nearly seventy-one years. At midnight they boarded the Concepción. The second example is from my novel, THE LAST PRINCE OF THE MEXICAN EMPIRE. Though fiction, this book is based on several years of original archival research. What empire? What prince? Well, it turns out that Mexico's first emperor, the Emperor Iturbide, had a grandson. Those of you know know your Mexican history will recall that the Emperor Iturbide was the final leader of Mexico's Independence from Spain, he was crowned Emperor of Mexico in 1822, he abdicated in 1823, and alas, he was executed in 1824. The Emperor Iturbide had two grandsons, actually, but I'm going to simplify and just talk about the one who was a two year old child in Mexico City when the second emperorMaximilian von Habsburgwhose arrival in Mexico had been made possibly by the armies of Louis Napoleonmade a secret contract with the Iturbide family to bring this child into his Casa Imperial. It's wasn't an adoption, exactly, but kind of sort ofthere's more to say about that, but the bottom line isand here is the surprise: in 1865-1866, the "high noon" of Mexico's Second Empire, the heir presumptive to the throne of Mexico was a two year old half-American. And this was Agustín de Iturbide y Green. Green like the color green: that was his mother's family name. And then came a tremendous drama, for his heart-broken mother tried to reclaim her child. The Emperor Maximilian arrested her and expelled her from Mexicoand she went straight to Paris, to her ambassador there, and got up such a scandal that the story made the front page of the New York Times: about "the kidnapping of an American child" by the "so-called Emperor of Mexico." This was the same time that the U.S. government was supporting Benito Juárez and his Republicans in their struggle to overthrow Maximilian and expel the French. Benito Juárez, as in Ciudad Juárez. Second, that so many marveled at my having spun a novel out of "a little footnote." Except for misinterpreted snippets, the story of Agustín de Iturbide y Green in the court of Maximilian may have been forgotten in the archives until I dug it out but it was no mere footnote. In a monarchy, the heir presumptive, though he be in a dress and diapers, is the living guarantee of the regime's future, and more: he is the living symbol of his future peoplehis subjects. Would Mexicans be subjects, creatures born to obeyor citizens, men and women who with their full rights participate in creating their own polity? This had been Mexico's bitter and bloody question for the whole of the nineteenth century. 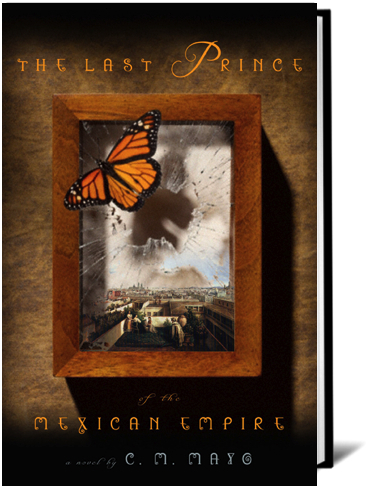 In telling the prince's story, from the high-noon of the Second Empire in 1865 to its collapse, and his return to his parents in Washington in 1867, I was telling the story of the fall of Mexican monarchism, a powerful idea up until that time, which asserted the mystical embodiment of all Mexicans in the person of a hereditary sovereign. To be honest, in sorting out Mexico's most convoluted and transnational episode, it took me more time than I would like to admit to boil my aim down to so few words. And so, in fairness, I should not have been surprised by the reaction of those readers, for whom (as it was for me) monarchism is just a quaintly ridiculous thing preserved in the formaldehyde of textbooks or the syrup of entertainment, and where still living, as in Spain and the U.K., its royal families harmless fodder for the sorts of magazines one reads at the hairdressers. But back to the last prince, Agustín de Iturbide y Green. The child's father, the second son of the Emperor Iturbide, was a Mexican diplomat, and his mother, née Alice Green, was a Washington belle, descended from the Platersa very prominent Tidewater Maryland familyand she was a granddaughter of General Uriah Forrest, who had been an aide to General George Washington in the American Revolution. So if you can believe it, I was able to find items of interest about the last prince of the Mexican empire in the libraries of the Society of the Cinncinati and the Daughters of the American Revolution in Washington DC. And much more in Washington DC: Agustín de Iturbide y Green's personal papers are at Catholic University; there is also a small archive at Georgetown University; and many documents, including the record of his parents' marriage and much about the family estate at Rosedale, in Washington DC, is in the Historical Society of Washington DC. Most crucially, the archive of the Emperor Iturbide and the archive of the Iturbide Family are not in Mexico but in the Library of Congress. Yes, there certainly are archives of interest in Mexico and in Texas and New York and Vienna and elsewhere, but the most pertinent ones for the story of Agustín de Iturbide y Green are in Washington DC. Why Washington DC? Upon the execution of the Emperor Iturbide in 1824 his widow and children had fled to Washington DC, under the protection of the Jesuits in Georgetown, where they had their college overlooking the Potomac. Flash foward to the early 20th century: Agustín de Iturbide y Green was living in Washington DC, teaching Spanish and French at Georgetown, when he sold the Emperor Iturbide and Iturbide Family papers to the Library of Congress. I'm sure he needed the space and the money, but given the turmoil in Mexico at the time, this was probably the wisest decision he could have made to preserve the papers. And I for one am immensely grateful that he did. Ah, archives, they are full to the brim with secrets and surprises. Which leads me to my latest book, which was prompted by a visit to an archive in Mexico City's National Palace where I found... a secret book. And on a whim, because I am a translator, I offered to translate it. And it was such a strange little book that I then felt compelled to write a book about that book. 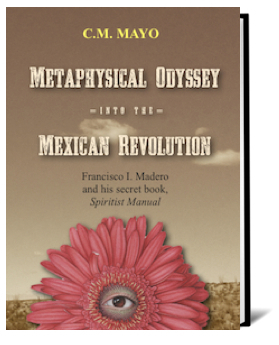 My book is: METAPHYSICAL ODYSSEY INTO THE MEXICAN REVOLUTION: FRANCISCO I. MADERO AND HIS SECRET BOOK, SPIRITIST MANUAL. Francisco I. Madero was the leader of Mexico's 1910 Revolution, and President of Mexico from 1911 to 1913, when he was overthrown in a coup d'etat and, with shocking casualness, executed. The Mexican Revolution then exploded into a new and more violent phase, churning on until 1920 with Alvaro Obregón's presidency or, as some historians argue, the end of the Cristero Rebellion in 1929. Popular imagery of the Mexican Revolution usually features rustic characters in bandoliers and washtub-sized sombreros, such as smoldering-eyed Emiliano Zapata, with his handlebar mustache and skin-tight trousers, or Pancho Villa, who always seems to wear the smirk of having just quaffed a beer (though he was a teetotaler; more likely it was a strawberry soda). Less often are we shown Don Francisco, handsomely-dressed scion of one of Mexico's wealthiest familiesusually bareheaded, occasionally in a top hatfor he was and remains a confounding figure. He was a Spiritist, and what the devil is that? I had no idea. And until 2008, it had not occurred to me to wonder. 2008 was when I first encountered his Spiritist Manual. Any student of the Mexican Revolution learns about Madero's first book, La sucesión presidencial en 1910, or The Presidential Succession in 1910, which was published in 1909. This spelled out Madero's political platform, and it worked like a magnet to bring together his political party and the nation-wide support for his candidacy and presential campaigns. Less known is that in 1911, when Madero was president-elect, under another nameBhima, after a warrior in the Hindu sacred text known as the Bhagavad Gita he published his Manual espírita or Spiritist Manual. Madero was in fact not only an ardent Spiritist but a Spiritist medium who left a substantial archive of his mediumnistic notebooks. In other words, Madero practised what is called automatic writing, or channeling written messages from what he believed were disembodied consciousnesses. These spirits urged him to write La sucesión presidencial en Méxicoand to write the Manual espírita. We are not our physical bodies; we are spirits, and as such we are immortal and we are destined, lifetime by lifetime, not by any ritual intermediated by clerics, but by freely chosen good works, to evolve into ever higher levels of consciousness and so return to God. Spiritism is the science concerned with investigating the powers of the human spirit, its past before ariving in this world, and its fortune on abandoning it. I hasten to mention, I am not the first to write about Madero's Spiritism. Enrique Krauze, probably Mexico's best-known historian, published Francisco I. Madero, místico de la libertad, which introduced the topic to a broad public, back in the late 1980s. Yolia Tortolero, who wrote her deeply researched thesis at El Colegio de México under the highly regarded historian of the Revolution, Javier Garciadiego, published that as El espiritismo seduce a Francisco I. Madero. Dr. Tortolero's is a both vital and superb work and by the way, you can now download that in Kindle. Others to mention are Mexican historians Manuel Guerra de Luna and Alejandro Rosas Robles, and the novelist Ignacio Solares who wrote the now classic novel Madero, el otro. That said, few of the histories of the Revolution give Madero's Spiritism more than a passing toe-curlingly brief! mention. His main biographer, Stanley Ross, relegates the Spiritist Manual to a footnote! And one otherwise excellent university press textbook on Mexico says that Madero was an atheistwhich is rather like calling the Pope Protestant. My contribution was to have translated the Spiritist Manual and to have given Madero's metaphysics more of an historical and North American context in a narrative that you might call "creative nonfiction''in other words, it's not a novel, but I hope it reads like one. I also had the prividege of being able to go through Madero's personal library which is the Centro de Estudios de Historia de México in Mexico Citywalking distance from my house, happily for me, because I had to visit multiple times to get through what is, very probably, one of the most important collections of esoteric literature in the Americas. Many, many secrets and surprises in there... Books on reincarnation, Williams James' favorite medium, Madame Piper, books by Madam Blavatsky, Annie Besant, Papus, Swami Vivekenanda, Dr. Peebles, Dr. Krumm-Heller, aka Maestro Huiracocha. ... But I am racing the clock. To conclude. The Jesuit missions in California, a half-American heir presumptive to the throne of Mexico, a revolutionary hero and president who was a Spiritist medium: each is a story that has interests who would prefer that it not be told. As for the Jesuit missions of California, my guess is that those setting the teaching agenda for the California public school system of my timethis would have been in the early 1970sfelt constrained by the available number of teaching hours and the state border, and if a major limb of the story didn't fit in their box, well, whack! Amputate as needed. As noted, until I drew it out, the story of the little prince, Agustin de Iturbide y Green, was languishing in archives outside Mexico and, in the days before the Internet, these were very time-consuming to track down and consult. Furthermore, until relatively recently, say, the past two decades, in Mexican academic circles, Mexican monarchism has been a hot potato of a subjectbetter not to touch. And in some ways it still is a hot potato of a subject. Another complicating factor, perhaps the most important, however, was that for the Mexican monarchists, the Emperor Maximilian's entanglement with the Iturbide family was embarrassing. It underscored the fact that after eight years of marriage Maximilian and his wife Carlota had been unable to produce an heir. And, alas, Maximilian and Carlota's treatment of the child's very young and heartbroken mother was hamfistedly cruel. Many things about the arrangement with the Iturbides were mystifying even to those close to the imperial couple, and especially for those unfamiliar, as most Mexicans were, with the rarified traditions of the House of the Habsburgs and of other European royal families. On their journey from Europe to Mexico in 1864, Maximilian and Carlota wrote a book of court protocol, Reglamento y ceremonial de la corte, which was published in 1865. Almost unknown is the fact that in 1866, a second edition was published with an all-new first chapter on The Iturbide Princes. It explained that the Iturbide princes were not imperial princesfor they were not children of the sovereigns. However, they had the status of the Murat princes. The Murat princes! Then, as now, for most they would be, shall we say, pretty obscure. The Murat princes were descendants of the King of Naples, Napoleon Bonaparte's brother-in-law. So the Murat princes were descendants of a sovereign and cousins to Louis Napoleon and so considered part of his Imperial Household. So we see that the eyewitness memoirs that were sympathetic to Maximilian are all strangely vague on the Iturbides or, as in the case of José Luis Blasio's Maximiliano íntimo, serve up slanderous stories about the Iturbides that are flatly contradicted by official birth, marriage and death certificates. But as an aside, I must mention that one of the biggest surprises for me was to have encountered José Luis Blasio's Maximiliano íntimo. Yes, I have my quibbles with it, and it is politically very incorrect: Blasio was Maximilian's loyal and admiring secretary. But it so sparkles with heart and with life that I would put Maximiliano íntimo on par with Díaz del Castillo's True History of the Conquest of New Spain as one of the greatest literary treasures of Mexico. And for the periodMexico's Second Empire or "French Intervention" Maximiliano íntimo is a gem beyond compare. Finally, Francisco I. Madero. For not all, certainly, but for many Mexicans, and indeed many members of Mexico's intellectual and political elite, Francisco I. Madero, Mexico's "Apostle of Democracy" as a Spiritist medium is a disturbing image. They regard the idea of communicating with spirits as a species of supersition, or pura locura, craziness, beneath the dignity of serious consideration. Moreover, if you didn't know already, I am sure you guessed, the Catholic Church prohibits Spiritism and its main ritual, the séance. The poet Alan Ginsburg, perhaps channeling Gertrude Stein, said, "Notice what you notice." As I understand it: that means, remove the filtersthe filters other people want you to wear to distort your clear vision. Notice. Notice what you notice! Next step: really look. And look again. Keep looking. Delve in. Whether your concern is Mexico, or the border, or El Paso, or the world itself, all manner of secrets and surprises await you.